The high seas were a vary dangerous place for sailing vessels for countless years. 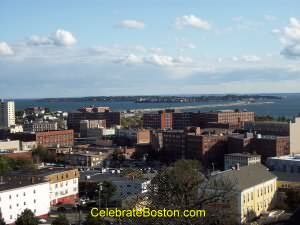 Massachusetts has its share of maritime folklore. Besides local ghost stories, and sailor's tradition about the infamous Flying Dutchman ghost ship, Massachusetts had for many years its own sea serpent. 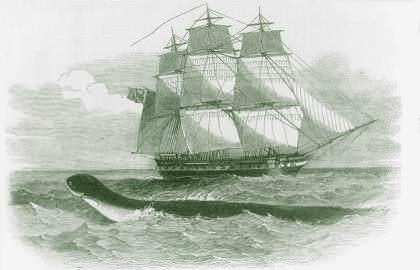 The Nahant Sea Serpent, also referred to as the Gloucester Sea Serpent, was a regular visitor to Massachusetts waters during the 1800s. According to A Book of New England Legends and Folk Lore by Samuel Adams Drake (1884), the first account of the monster was at Gloucester in 1638. John Josselyn Gent wrote about the serpent being observed: "[Coiled] up on a rock at Cape Ann by a passing boat, and that when an Englishman would have fired at him, an Indian hastily prevented his doing so, saying that it would bring them ill luck." Two hundred years later in 1817, the serpent was spotted off Cape Ann by hundreds of spectators, which greatly publicized the existence of a sea monster in Massachusetts waters. "That shiny sea serpent which has been such a terror along the New England coast during the past few years has made his debut in Nahant waters this season. He was seen on Monday and again this morning, and the circumstances of his presence are given in such detail by astonished beholders that there is general credence given to the statement that an unusual and prodigious serpentine monster is [displaying] himself in the waters of Massachusetts Bay. The observers had glasses which enabled them to see distinctly that the strange monster was of an unusual species, and there are many around here who believe it to be a veritable sea serpent. There is of course considerable excitement all along the beach, and some old fishermen who were out early this morning have added to the general commotion by claiming that they too got a momentary glimpse of the mysterious stranger. This latter report would not be regarded of much account but for the fact that when the fishermen told their story they had not heard of the discovery made by other parties on Monday. They say they only saw it for a moment, that it seemed to be about 30 feet in length, and was meandering through the water with head slightly elevated, and at times nearly the whole body would seem to rise partially up out of the water. The summer visitors here are not skeptical about the monster being of a snakey species, and the citizens are, many of them, of the opinion that he is nothing short of a veritable sea serpent. The same or a similar one was reported along the coast several times last summer, and on one occasion his identity was vouched for in enthusiastic earnest by the officers, crew and entire lot of passengers on board one of the Philadelphia steamers, who sighted the strange being a few miles below Boston Light." The sea monster was most likely a large whale of course. A curious sea serpent was also observed by the crew of a large sailing vessel off Mount Desert Island, Maine, back in 1793.